Wuhan Honda Trading Co., Ltd.
Room4503, Tower 1, New World International Trade Centre, 568 Jianshe Avenue, Wuhan 430022, P.R.C. 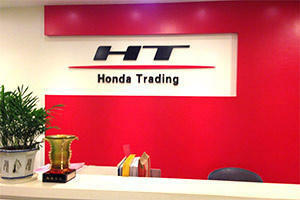 Honda Trading (China) Co., Ltd.
We consider our most valuable capital! Realize the dreams is the positive driving force that motivates us, honesty is our action benchmark, we keep self-examination and continue to improve. Honda Trading China region group is a big family with love and vitality，we are striving for become your desired company. We respect for the individual, we focus on the continuous value added and personal growth, cultivating diverse work force, working hard for realizing our vision. We sincerely invite you to join our big family, share our success and joy with you, advance for our dream together.